Sign Up For A Payoneer Account Today And Earn a $25 Reward! Are you a solo freelancer, blogger, publisher, affiliate marketer or a business owner? Then you must agree with me that getting paid efficiently is very crucial. Payoneer is one company that’ll save you a whole lot of stress and it's risk free. The thing is, the traditional payment channels have certain set-backs. For instance PayPal allows Nigerian and some other countries to only make online payments but can't reacieve or withdraw! What a shame!. Payoneer was founded in 2005. It is a U.S company that provides cost effective payment solutions for independent workers and countries world-wide. You can make payments, receive payments or verify other accounts, using Payoneer. You can link your Payoneer account to your PayPal account. You can also withdraw to your bank account anytime. 1. Risk-Free: Financial institutions engaged in this payment processing (systems), have an established and appropriate risk management process that identifies, measures, monitors, and limits risks. Payoneer security is high class as they understand exactly where and how sensitive account data should be stored and transmitted – Your data is very safe and highly protected. They have a state of the art security protocol to protect your account against attackers and hackers and maintain performance and efficiency irrespective of rising or increased transaction volumes – (customer experience is always maximized) and this complies with Federal and state laws and regulations; as well as with operating rules of clearing bank-card networks. 2.Faster Payments: Due to their fantastically automated systems, payments via Payoneer is fast and certain. As freelancers and affiliates,you can receive your payments within minutes! 3. Over 2000 Ways to Earn Online:With a Payoneer account, you already have a very large sea of potential companies to make money with. These companies have partnered with Payoneer by applying for a Payoneer Mass Payout Account. 4. No Limitations: You are allowed an account to account transfer limit of $5,000 per month; with a Personal Payoneer Account. If you want a much higher payment limit. If you want a much higher payment limit (usually, to pay your employees, partners, affiliates or clients), then you are going to be needing the Payoneer account meant for businesses called Payoneer Mass Payout Account. So in essence, if you’re limited by a personal payoneer account, you can always upgrade to a Payoneer Mass Payout Account; where there aren't any limits to the amount of money you can payout per month! 5. Lower Fees Rate: Payoneer work together with all their partner companies to set relatively lower fees rates; even though different Payoneer partner companies have different card fee(s) rates. 6. Global Payment Service:You are not even limited to making money from only Payoneer Partner Companies! With a payoneer account, you can receive payment from the U.S, EU, UK and Japan. 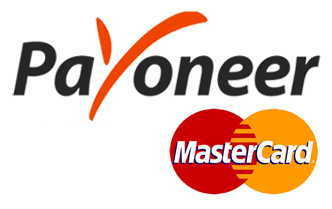 Once you Sign up with Payoneer, send your receiving account details to their customer care. They’ll make the payment options available in your account and you would be shipped a new payoneer card to your address. 7. Transfer Received funds to Your Local Bank Account: Add your local bank account details to your Payoneer account and with a click, transfer your funds to your bank account (available in more than 100 countries). Please read their blog posts to know if withdrawing to local bank accounts is available in your country. 8. Withdraw Using Payoneer Prepaid MasterCard® Card (Anywhere in the World): Within minutes of receiving payment into your Payoneer account. 9. Spend In-Store or Online:As soon as your funds land in your Payoneer account, you are free to start spending it online, or at malls with a POS machine. Pay bills, suppliers, shop online or any other expenses; without the risk of overdraft. 10. Automated Processes:Almost all of Payoneer’s processes are fully automated; to increase effectiveness and speed of payment delivery. Payoneer is waxing stronger by the day, and I see them outrunning PayPal in the nearest future. Payoneer is available in many countries that easily get left out by other over-zealous services.The value they offer their clients, is their biggest selling point they have, letting them bag numerous awards in the past. Free $25: Here is how this whole thing works. Payoneer will pay both the referrer and referral, $25 each (not instantly).Whenever you make up to $100 into your Payoneer account (through Fiverr, Amazon, Adsense, Clickbank and countless other affiliate and freelance Payoneer partners), Payoneer will pay you your $25 bonus! Sign up today and get $25 HERE fill in the sign up form. The sign up form is so easy for everyone to understand. Make sure to provide your correct details. You are required to scan and upload your Government-issued National ID Card (the temporary or permanent one). If you don’t have that one, you can scan and upload your International Passport. 1.You must be 18+ years of age. 2.You must provide your correct data (name, date of birth, documents etc. ); if the information you provided doesn't tally with the one on your scanned documents, your application will be declined. 3.You must have either a valid National ID Card or an International Passport. 4.You must have either a valid Driver’s License or Voters Card.Tip: Make sure the scan is clear and all the edges of the document are visible. 5.Your valid home address and Postal Code will be required. Make sure the address you supply is correct – If not, the MasterCard will be lost in transit or not be delivered to your home address. 6.Your Postal Code is a 6-digit number e.g, 400221 Note: Postal Code is not P.O Box! To get the correct Postal Code for your area, visit your Country’s postal service website, to check the right code for your location. Important: I’d advise you to use the P.O Box option (especially for those that cannot get a valid Postal code for their location). Aside that, most countries don’t have an organized address system. That is why many applicants complain of not receiving their Master Cards at all. This is because your package was delivered to a wrong address. It is advisable to use the P.O Box option if you know your address will be hard to find. It is possible to use someone else’s P.O Box to receive your package. Ask them for their P.OBox number. But fill your own details as the package receiver. Another identification document will be further required. This is necessary after the first stage i.e; after they’ve accepted your National ID or International Passport. For this next stage, scan and upload your Drivers License (the temporary or permanent one). If you don’t have a drivers licence, scan and upload your Voters Card. “Dear [Your Name], Congratulations - your Payoneer account application has been approved! Your Payoneer Prepaid Debit MasterCard® card has been shipped to you by: Regular mail. Your card is estimated to arrive between [a date and a date]. For example, 12th Nov 2016 and 20 Nov 2015. Please also note the birthdate you used to sign up as if you forgot your password you would use it to verify that you are the account owner. Follow the instructions in this post, and you'll successfully sign up to payoneer. I have tried applying for payoneer and I hope to get my card delivered to me soon. Thanks..